Hello, all! How was your weekend? I was very busy filming and editing a lot of video footage for an upcoming class. I need to film one more piece and I should be all done! Hopefully I’ll be able to finish doing that tomorrow. 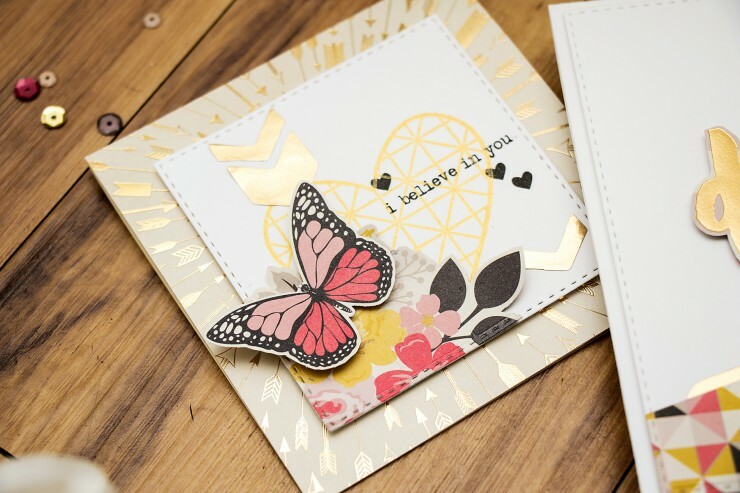 Today I’d like to share two more projects created using Simon’s October Card Kit. You can see my video using this kit here and another card here. 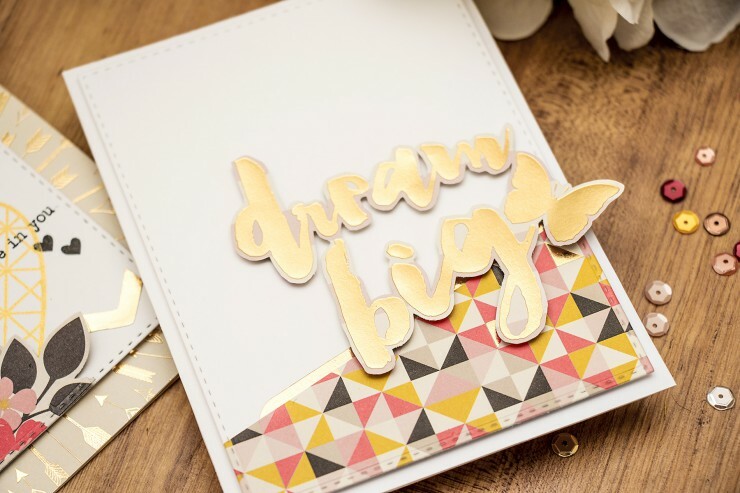 For my Dream Big card I first adhered a piece of patterned paper trimmed diagonally onto a piece of white cardstock. Next using Simon’s stitched rectangle die I trimmed this piece down and add a nice faux stitched edge. Love it! I never seem to get enough of this die. I used my scissors and a journal card and cut around the sentiment leaving a small border to fake a die cut look and foam mounted this piece onto my panel which was also foam mounted onto the card base. 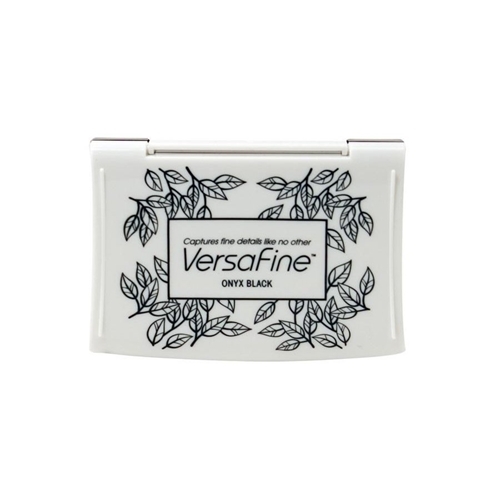 Finally I stamped a sentiment and several hearts using Tsukineko Versa Fine Onyx Black Ink. So yummy cards! I just love how you work with gold! Wanna learn working with gold? Go check Yana’s blog! I am desperately trying to stop using SO MUCH gold, lol! Not working 🙂 thank you, darling! 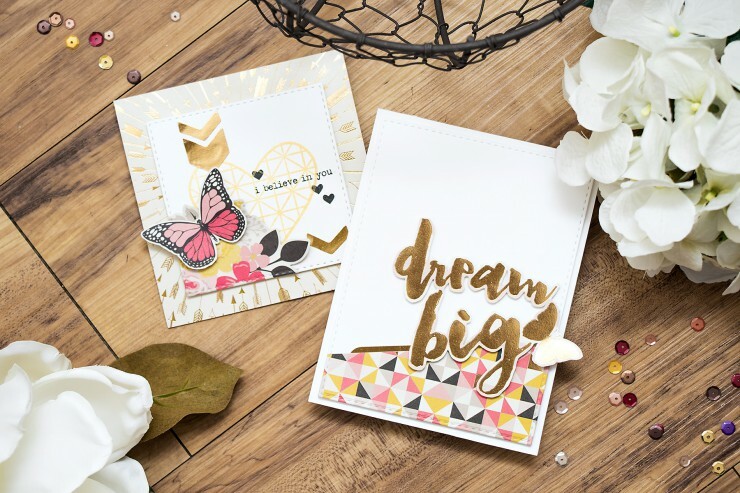 I love love what you did – I immediately thought the saying was a die cut and was looking through your list of products to find it and then went back and kept reading…LOL – on another note – I’m so thrilled to be taking your class at CHA! woot woot! I’m so excited about CHA! can’t wait! and thank you! What amazingly beautiful cards Yana!